Where to begin telling this story? 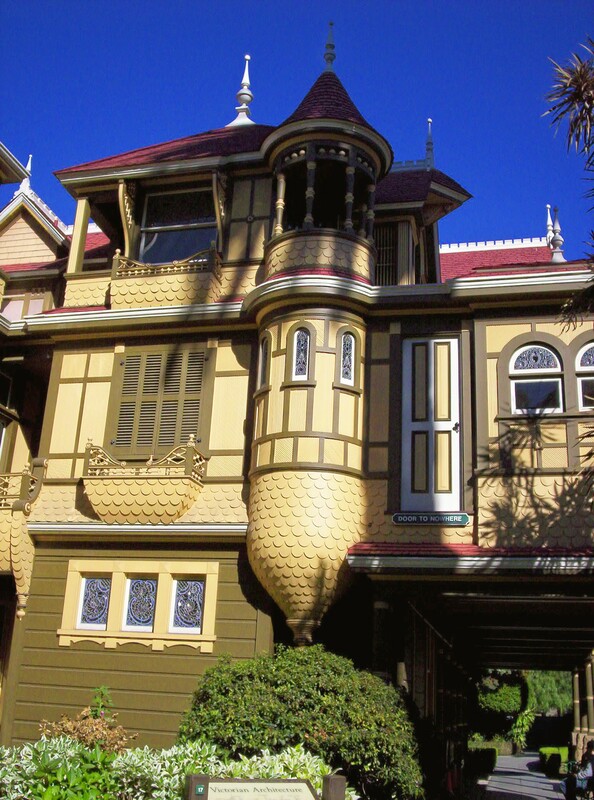 I suppose it begins when I noticed a line in the literature for this year’s World Fantasy Convention to the effect of, “Some of you will certainly be interested in visiting the Winchester Mystery House.” I just about jumped out of my chair! 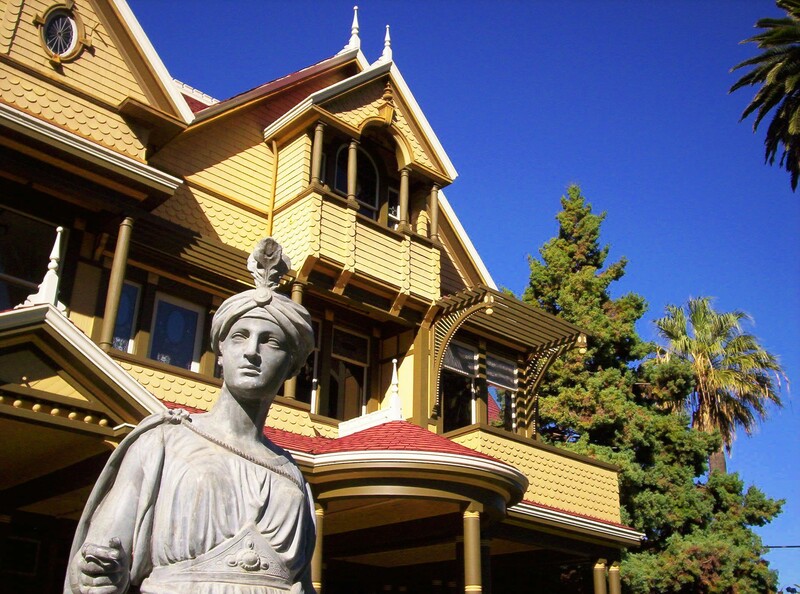 Some years ago I’d read about the Winchester House, and it sounded delightfully bizarre. It was on my list of Places I’d Love to Visit; but I’d always thought of it with the wistful conclusion: “But when will I ever be in California? Sigh. . . .” Out of the blue, here was the chance! Here it was, just across town from the site of WFC 2009! Coming from Japan, I’ve discovered that the thing to do is schedule my arrival at the con for Wednesday. Things on the program don’t usually start happening until Thursday afternoon or evening, so there’s a little cushion of time there which allows for delays, and if all goes well, for a leisurely trip from the airport to the hotel (this year I found my way by free bus and the Light Rail train system) — and I really like having Wednesday night to settle in and explore the hotel and the neighborhood — to watch people arrive . . . to find where different events will be held . . . to find the gift shop where I can buy postcards . . . to let the excitement build. . . . Anyway, it occurred to me that if I was going to try to see the Winchester House (and I knew I’d forever regret it if I didn’t), the best time would be Thursday morning, so that I could enjoy being a tourist without having to miss any of the convention itself. So I asked at the Fairmont’s desk, and the night clerk got right onto her computer and figured out the very best way for me to get there at the time I wanted. She also confirmed that the place was open then. She printed out a map with instructions for me, and drew friendly circles and lines on it for emphasis. Early the next morning, I made the brisk walk to the bus stop and got confused from square one: I wasn’t sure which side of the street to be on. When I thought I had it straightened out, I was disoriented all over again by the fact that a bus pulled up about ten minutes ahead of when it was supposed to. That never, ever happens in Niigata (unless it’s the previous bus arriving way late), so I was suspicious — but everything written above the windshield indicated that it was the bus I wanted. Still, I asked the driver. His face showed no reaction when I said I was trying to go to the Winchester Mystery House, and I thought, “Oh, boy. It’s not that well known, even to the locals.” But when I finished my question that included the number and destination of the bus, he nodded and said this was the right bus. My next challenge was trying to figure out how to pay and where to get off. When I realized I didn’t have the right change, I asked the driver if there was a change machine. (Is that a dumb question in America? In Japan, buses have change-making machines that are separate from the hopper that takes your fare money.) He said there wasn’t, and if I didn’t have the right change, then I could ride for free. He turned out to be a lot friendlier than his stony countenance suggested. “Stop doubting yourself,” he told me. “This is the right bus. I’ll tell you exactly where to get off.” And to my surprise, he actually chatted with me for most of the way there — something that I think would be illegal in Japan. He talked about the geography and economy and culture of San Jose, and how he’d lived there all his life. 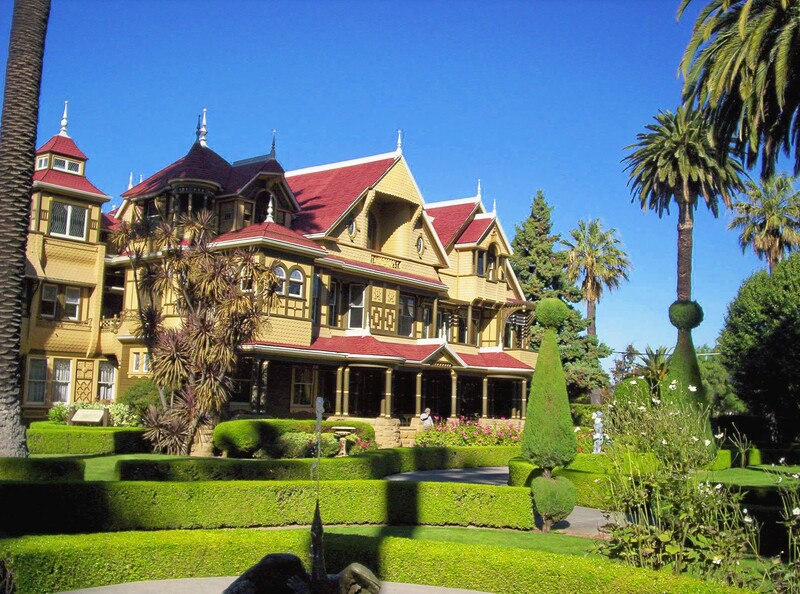 Finally, he announced he was going to make a special stop for me which was very close to the Winchester House. He told me to cross the intersection just ahead, to walk straight about 500 yards, and I’d be there. I didn’t have the $2 for the fare; I offered to give him $5 for all his help, but he wouldn’t take that. I realized I had two hundred-yen coins (about $2), which I thought he might like as a novelty, but he wouldn’t take those, either. He was just a very nice native of San Jose who wanted a visitor to have a good experience in his city. So I got off the bus, crossed the intersection, and walked for what seemed like a good deal more than 500 yards. I was starting to worry. I didn’t see anything that looked like a Winchester Mystery House. I was expecting some stark, imposing, Dracula’s-castle-type structure dominating the horizon, but all I saw were homes, modest buildings, and a shopping mall (which the driver had also pointed out to me). A part of my mind had a pang of fear: was this some gag local bus drivers liked to play on unsuspecting tourists?–Let them off in the middle of nowhere, or in the midst of a gang war zone? But then the more philanthropic part of my mind took over and said, “No, I must be right on top of it.” I was in front of an inviting-looking diner. 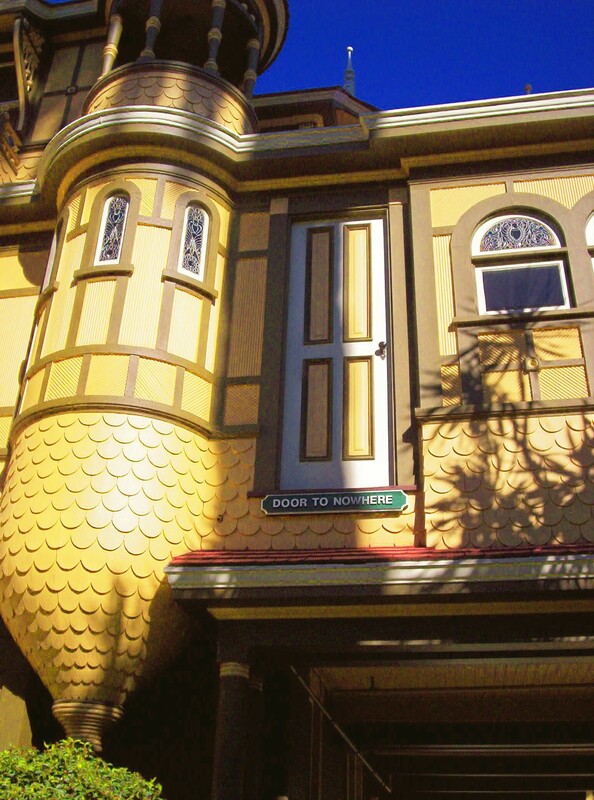 It was 8:30 a.m., and I knew the Winchester House opened at 9:00, so I thought the best plan was to stop in at the diner for breakfast and ask for further directions. I said that was fine. It was a good breakfast, enlivened by the waitress’s singing, which she did (she loudly announced) because she knew it annoyed one of the waiters. I enjoyed basking in the experience of America — all these things you never see in Japan. Waitresses singing? Wobbly seats?! It may have been a singular egg, but they were generous with the coffee (another thing you don’t normally see in Japan: refills). And finally I asked where the Winchester Mystery House was. Sure enough . . . I still didn’t see anything that looked like the Bates mansion in Psycho, but there was a ticket booth, and there were lots of signboards explaining the various available tours. The most basic Mansion Tour is $26 and takes about an hour. That was about right, I thought, for the time I had. So I looked around the gift shop until tour time, 9:15, Tour One of the day. Our tour left from the courtyard outside the gift shop. There were three of us. You already know me; the other two were a mother and a daughter in her late twenties (I’m guessing). Our guide was a small, rotund, white-haired man who dashed ahead of us, cajoling us to keep up; whose stream of facts and anecdotes was fascinating and at times incoherent; and who frequently paused to bray with laughter at his own jokes — which often we hadn’t heard clearly enough to appreciate. I generally just grinned and nodded, which made him laugh all over again. The house was nothing at all like I’d expected. I’ve been in homes of some very rich people, but this was nothing like any of them. I’d expected high ceilings, chandeliers, wide corridors, balconies, etc. But no — this was more like a hobbit-hole adjoining a stable adjoining an attic. . . . No one space seemed very big or grand, but the odd little rooms, passages, and stairways went on and on, round and round. Our guide floated ahead up shadowy flights and around dusky corners like a will-o’-the-wisp, his voice echoing among the boards and panes. 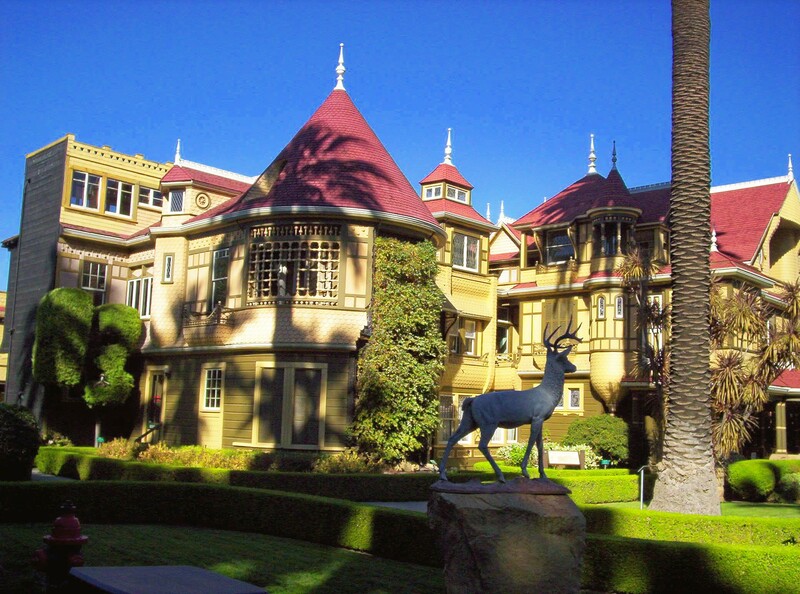 I quickly began to see how it would be very easy to get lost in the Winchester House. There was no clear sense of direction . . . nor of particular level. We were always ascending, descending, circling around. I suppose the story is best told in pictures, though I’ll intersperse comments as necessary. . . . In 1884 the construction began. It continued without interruption, including weekends, until the death of Mrs. Sarah Lockwood Pardee Winchester on September 5, 1922. Mrs. Winchester seems to have believed that the spirits of those killed by Winchester rifles were angry at her family; and that they were telling her to keep building and building on the home to please and provide a lodging for them. 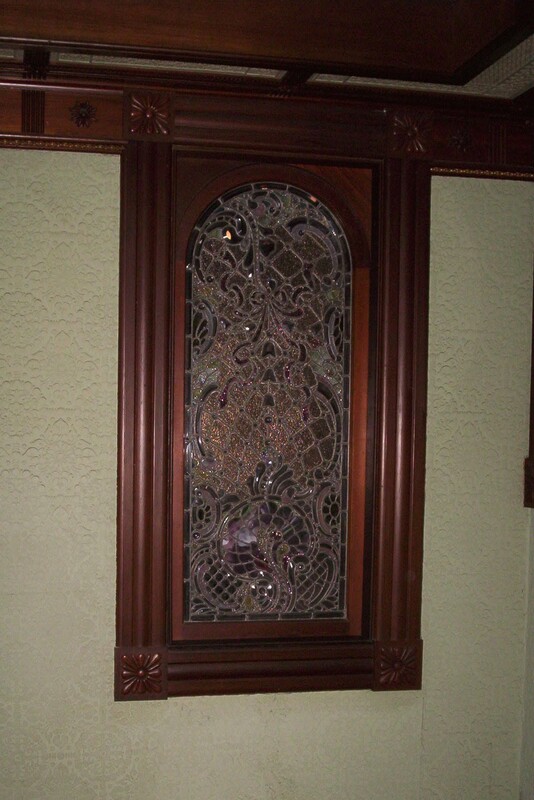 The number 13 appears again and again in various motifs throughout the house. 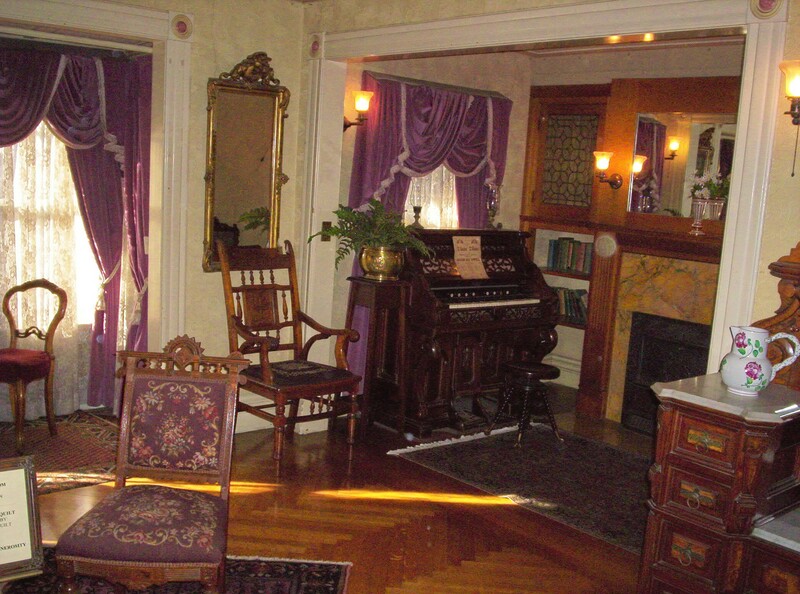 In the Seance Room where Mrs. Winchester went to speak with the spirits late at night, there are 13 hooks on which she would hang her 13 colored cloaks used in the rituals. Many windows have 13 panes. There are 13 bathrooms, with 13 windows in the 13th bathroom. 13 rails by the floor-level skylight in the South Conservatory; 13 steps in many of the stairways; 13 squares on each side of the Otis electric elevator; 13 glass cupolas on the Greenhouse; 13 holes in the sink drain covers; 13 ceiling panels in some of the rooms, and 13 gas jets on the Ballroom chandelier (originally 12, but Mrs. Winchester had the 13th one added!). Mrs. Winchester's will had 13 parts, and she signed it 13 times. The front half of the house was sealed off after the 1906 earthquake, including the Grand Ballroom, and was never used after that. When the earthquake struck, Mrs. Winchester herself was temporarily trapped in a part of the house, and she had to be rescued! 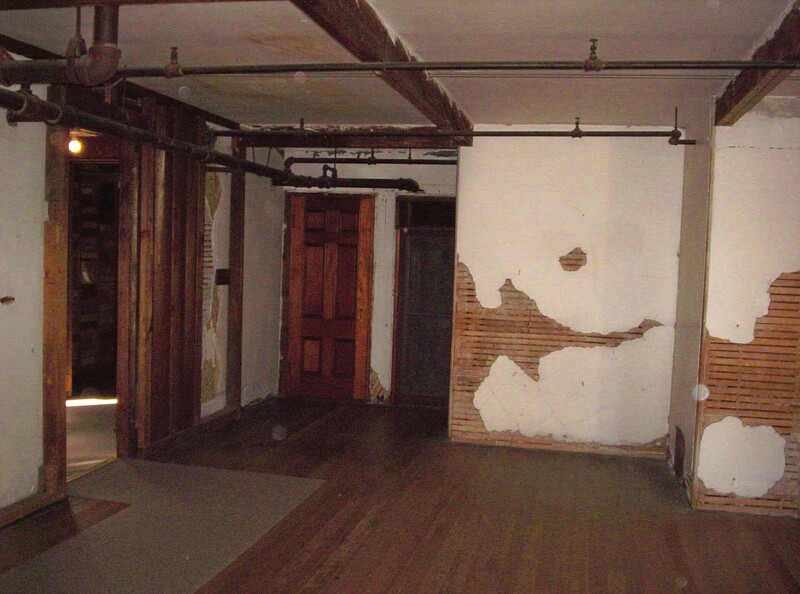 The story is told that one day Mrs. Winchester discovered a dark handprint on the wall of the wine cellar. Believing it to be a dire omen, she ordered the wine cellar sealed up. (The print was likely made by a servant with dirty hands.) Construction continued, and the wine cellar was never again relocated! It's still down there somewhere, stocked with its selection of VERY well-aged wines. . . .
Harry Houdini toured the house at midnight in 1924 in an attempt to communicate with the spirits. With her inheritance after the deaths of her husband and mother-in-law, Mrs. Winchester had an income of $1,000 a day--back in the days before income taxes. Oh! That picture above is The Door To Nowhere. On the second floor level, it opens onto a sheer drop to the ground below. Here's a more distant view of The Door To Nowhere. Mrs. Winchester spent $5,500,000 building this house of 160 rooms. The story is told that one day, President Teddy Roosevelt came to the front door to speak with Mrs. Winchester. A gardener, not recognizing him, told him to go around to the side entrance "like everyone else." The President left in a huff, and he and Mrs. Winchester never met. Here's our guide, demonstrating that some doors don't lead anywhere. Mrs. Winchester herself was of a very small stature. The door on the left is normal-sized. The one on the right was built for Mrs. Winchester. 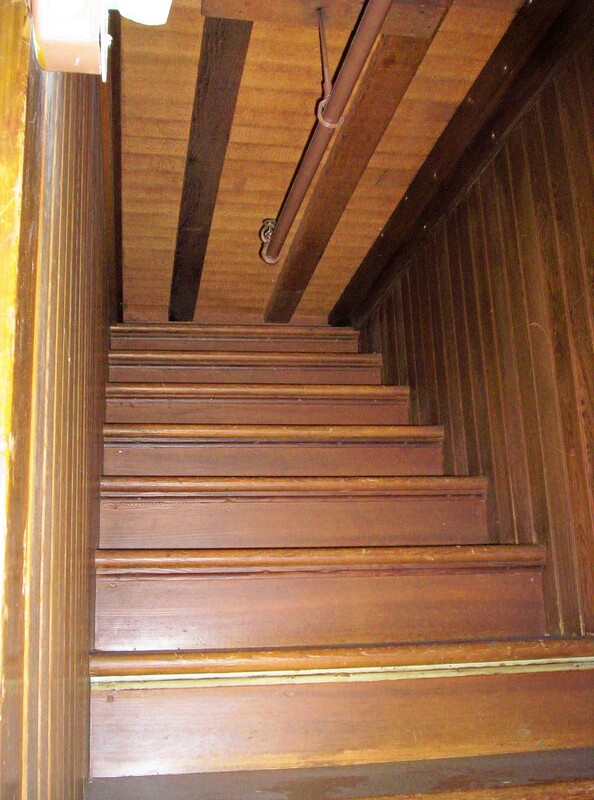 This stairway ends against a ceiling. Another descends 7 steps and then rises 11, so you go down to go up. The famous "switchback staircase" has seven flights of which the vertical rise is so small that the whole only rises about nine feet; it includes 44 steps only 2 inches in height! 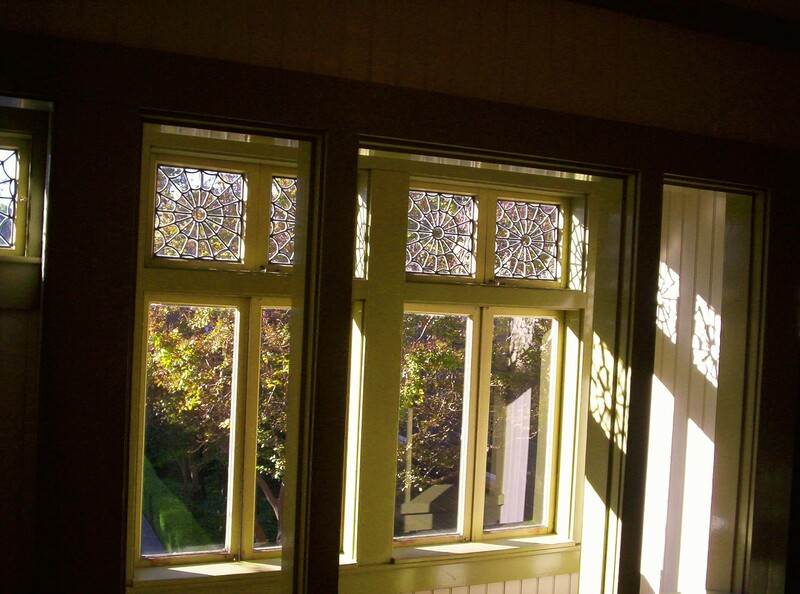 Mrs. Winchester herself designed the special daisy and spiderweb patterns that are embedded in many of the windows. The daisy was her favorite flower, and some believe the spiderweb pattern had a special occult meaning for her. 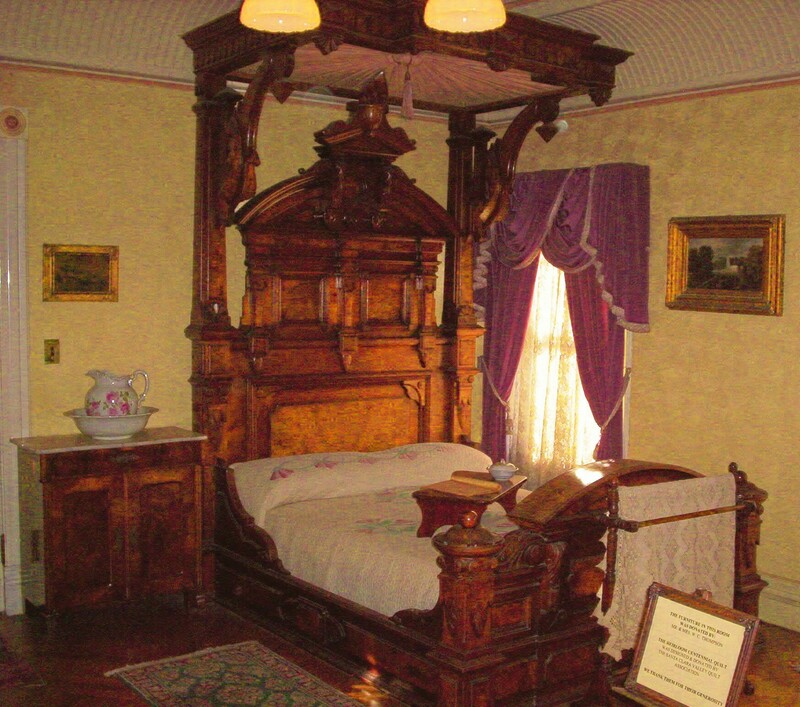 Mrs. Winchester passed away in this bed. On the lawn outside is a mysterious crescent hedge of boxwood, the upkeep of which she was most meticulous about. One of its points is aimed directly at this bedroom. 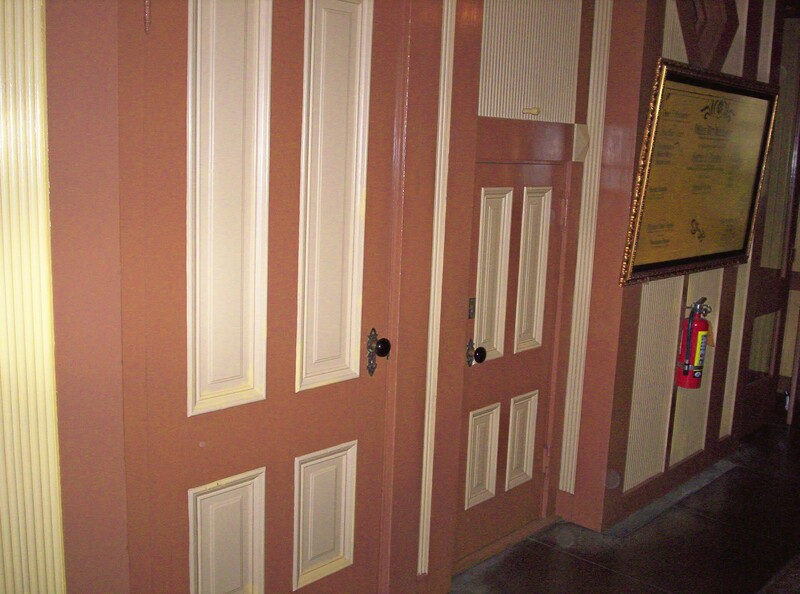 Servants who had worked for Mrs. Winchester for many years tended to become superstitious; some whispered that she could walk through walls and unopened doors. What is certainly true is that she had many features built into the house that allowed her to spy on her servants as they worked; and she was notorious for materializing silently behind them. Even so . . . her servants were paid better than anyone else's, and she included her favorite servants in her will. To work for Mrs. Winchester was a job greatly to be desired. 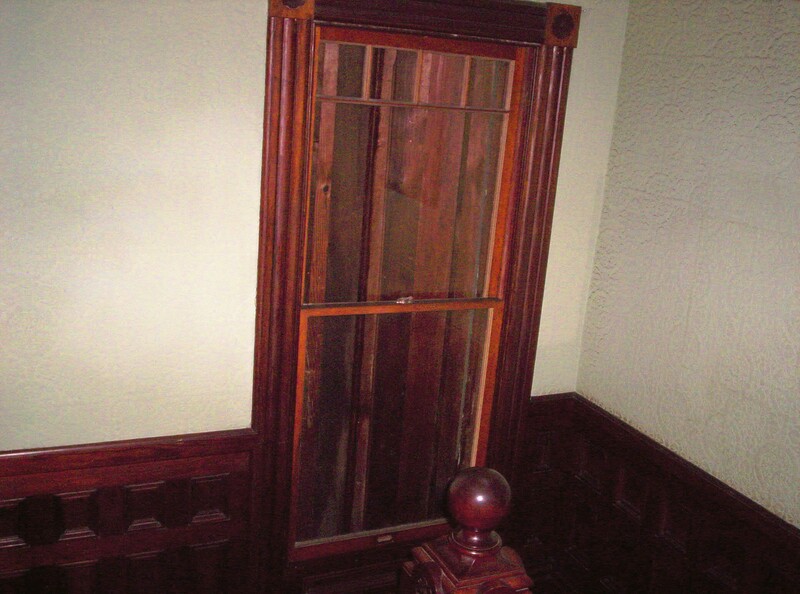 The smallest cabinet in the house is only a half-inch deep, and was supposedly designed to house a hanging calendar. This one, the largest, opens into the back thirty rooms of the mansion. This is that stairway, I think, that goes down to go up. Legend says, by the way, that Mrs. Winchester never slept in the same bedroom for two nights in a row; she was trying to stay one step ahead of malevolent spirits. We poor kids who didn't have a fortune like hers had to sleep in the same bed every night. . . . 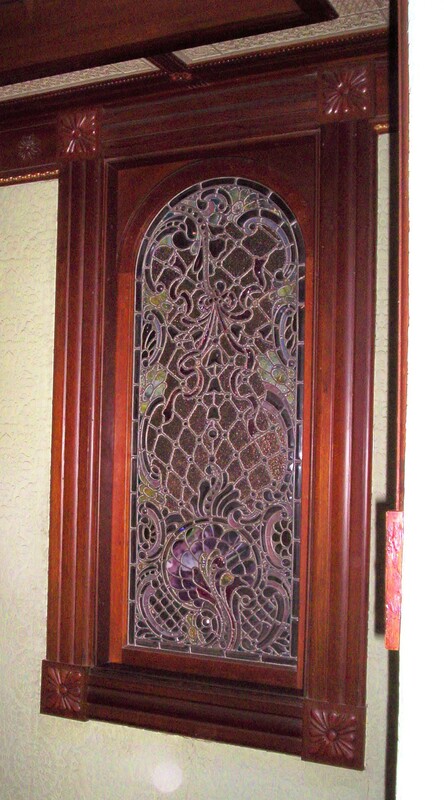 This is the most expensive art glass window in the house, purchased through Tiffany's of New York. Mrs. Winchester originally installed it in an outside wall, but later added a series of rooms that blocked off all direct sunlight. So the lovely stained glass sits now in darkness . . . like the $3,000 doors which were never used. I'm not really sure what I took this picture of. I think it's a window that looks directly into the elevator shaft. Mrs. Winchester was quite the Bill Gates of her day -- Ms. High Tech! Here's that stained-glass window again. The eccentric convolutions of the house have been explained in this way: the twists and turns were very disconcerting to evil spirits, who are naturally suspicious of traps. Carbide gas lights in the house were fed by the estate's own gas manufacturing plant, which used a new process. The gas lamps were operated by pushing an electric button. 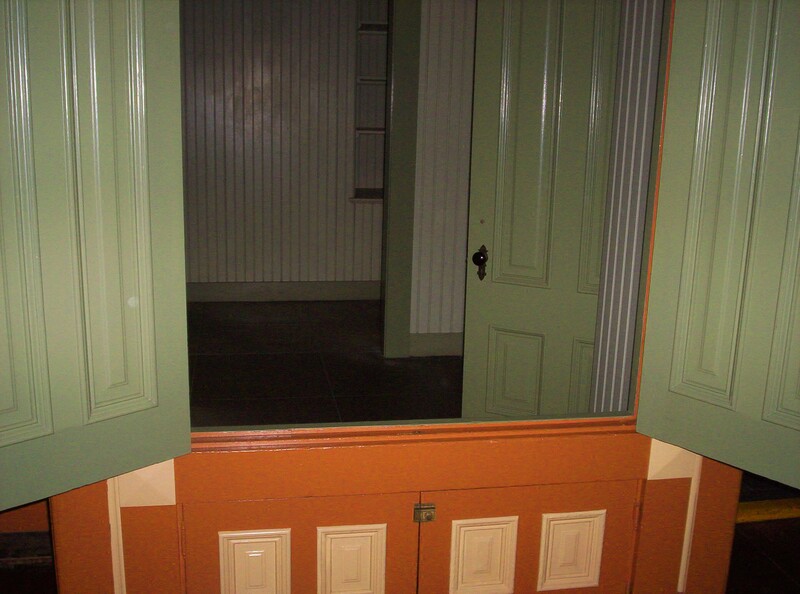 THIS, I think, is actually that cabinet that opens into the back thirty rooms. 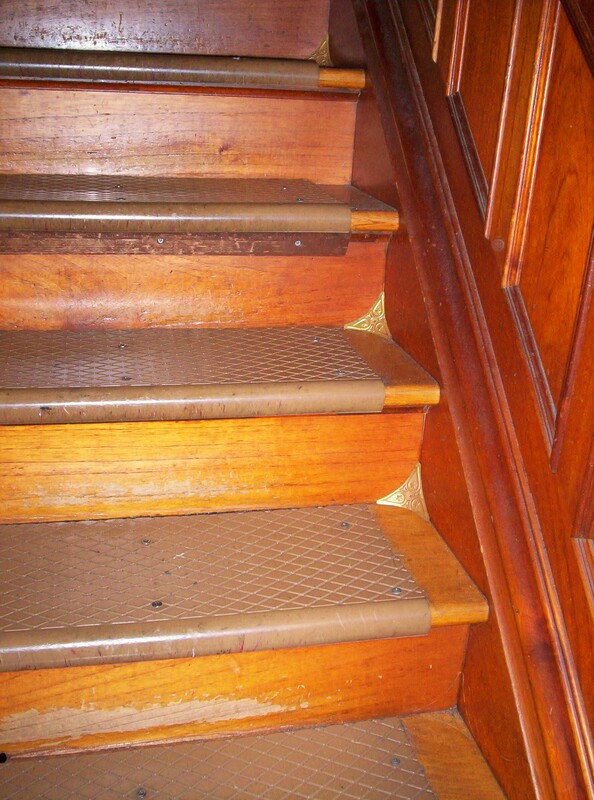 Check out this innovation: to make the stairs easier to clean, Mrs. Winchester designed these corner pieces so that dust couldn't accumulate in the corners. So it's an eerie place, couched there unseen among the homes, businesses, and traffic lights of modern San Jose. They offer lantern tours on Hallowe'en night. That would be pretty cool. The ravages of the great 1906 earthquake remain. And this concludes our tour. In conclusion, a note about the floor of Mrs. Winchester’s bedroom, the one in which she died, the one at which the boxwood crescent points. (One craftsman worked for 33 years doing nothing but building, installing, and tearing up the parquet floors!) In the bedroom, the floor is laid so that the sunlight streaming through the windows appears to change the dark strips to light, and then back again, when viewed from opposite ends of the room. 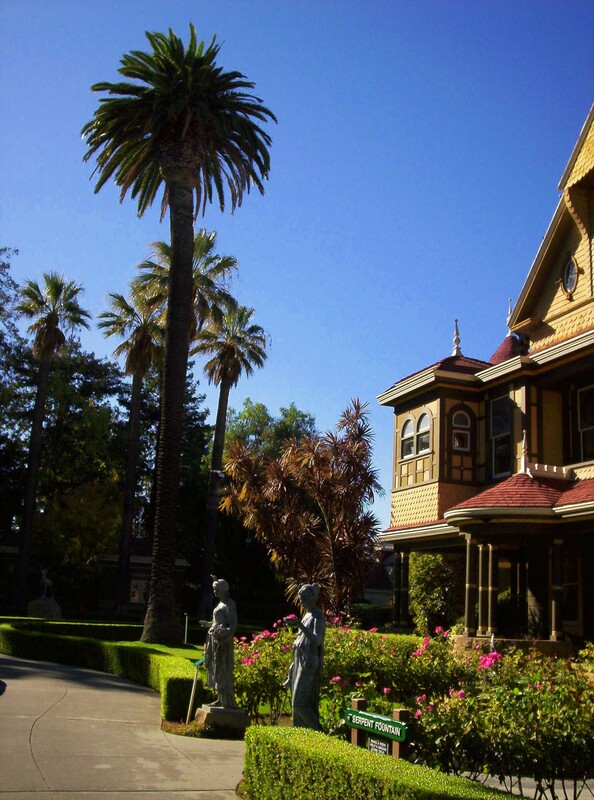 So, too, I think the discoveries at the Winchester House would be endless, if one had the time and inclination to observe it carefully, to watch the play of its shadows, and to listen to its whispers. This entry was posted on December 12, 2009 at 8:25 pm and is filed under Uncategorized. You can follow any responses to this entry through the RSS 2.0 feed. You can leave a response, or trackback from your own site. WOW! 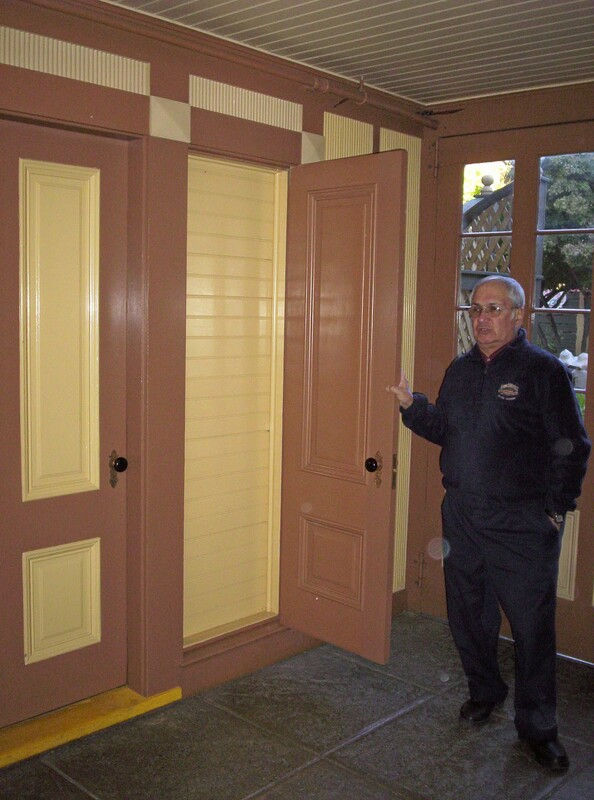 Thank you for the tour through the Winchester Mystery House. I lived in CA for 30 years and never knew about it. This is wonderful. It was almost like going myself! Thanks for making this detailed post, Fred. It’s wonderful. 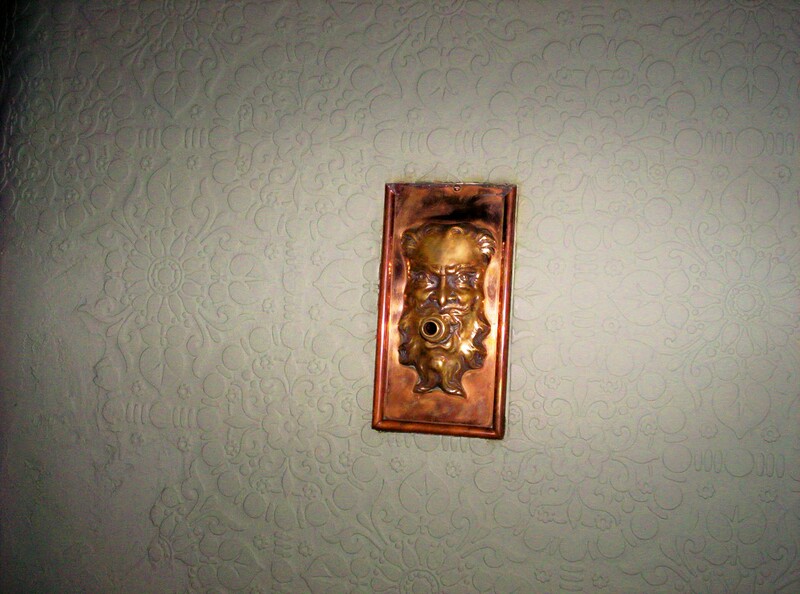 You took beautiful photos of it all too- and I love the extra touches- I never knew about the corner dust fittings- that’s a great idea and a nice little bit of trivia that you just don’t get in the documentaries about the house. Hmmm…I have lived about a mile from this place for the last two years. I really need to go check it out eventually! Thanks for the fabulous tour, Fred! 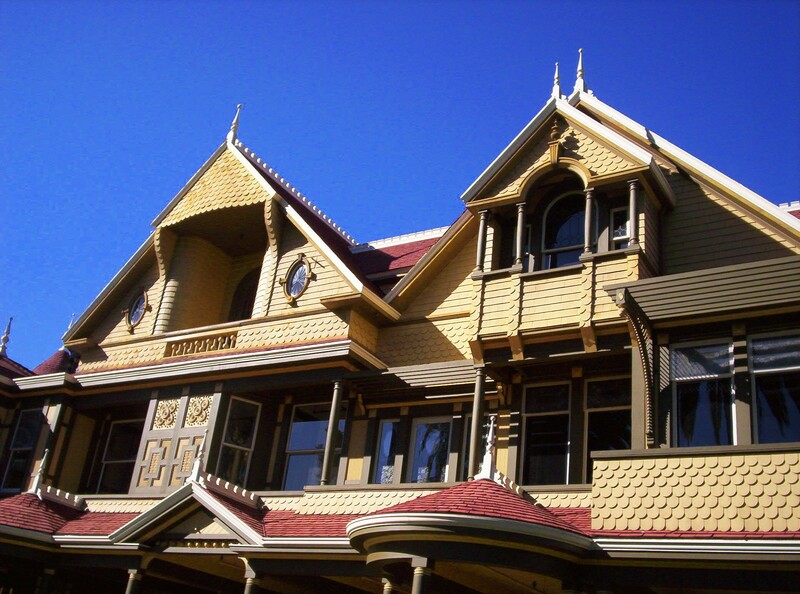 I’ve always wanted to visit the Winchester House, but have never had the chance. Your tour was really interesting and well photographed. I have wanted to hit the Winchester house for years! Decades! But on the couple of occasions I’ve been in the SF area I haven’t had or taken the time to do so! Thanks for the photo tour! It just whets my appetite more. I enjoyed the tour; thanks so much! How creepy! I loved the photos; I think, though, that the most interesting part for me was the story behind it. That poor woman, terrified of spirits, building and building and building this house full of trapdoors and spiderwebs and symbolism. Always building, always trying to escape . . . like I said, creepy! Thanks for the tour. Anyway – I recently read a biography of the brothers, one that is supposed to be their definitive story, and this book made the case that Margaret Dumont survived working with these brothers all those years because she knew very well what was going on. She had been doing stage work for years before she began working with the Brothers, and by many accounts, was no dummy. So it’s this author’s contention that the image of Ms. Dumont being as far behind in real life as she appears on screen was manufactured. With that in mind (sorry for the long analogy), isn’t it possible that this woman in the Winchester house knew exactly what she was doing, and was motivated more by a sense of fun and adventure, rather than quivering fear? I am in no way trying to take away from the mystery of the house – I really do think it’s cool. But for a woman to create SO many bizarre elements, almost none of which seem comforting, implies a much steadier mind than the house upon first glance might imply. 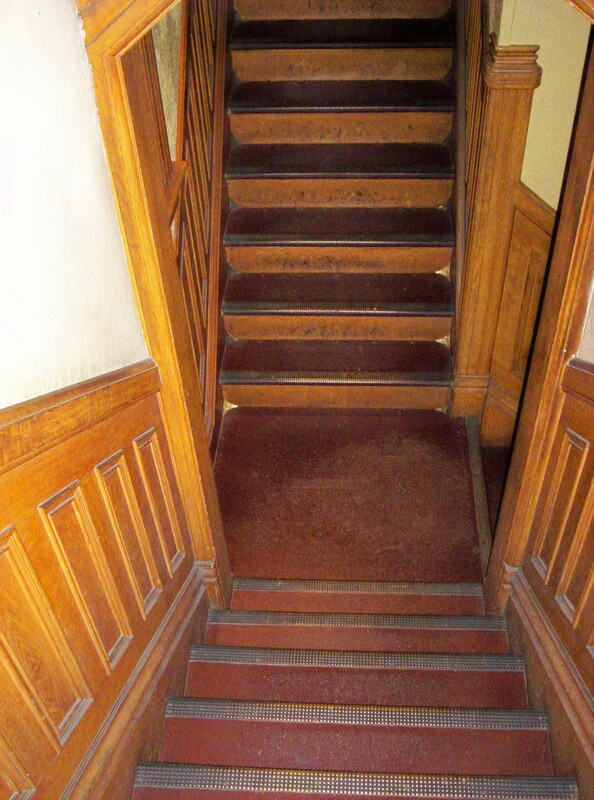 It’s just a thought – and is it wrong of me to be really, really impressed with the little curvy pieces in the corner of each stair to make cleaning easier? And Fred, do you remember at Concordia that there was a staircase that lead right into a wall? 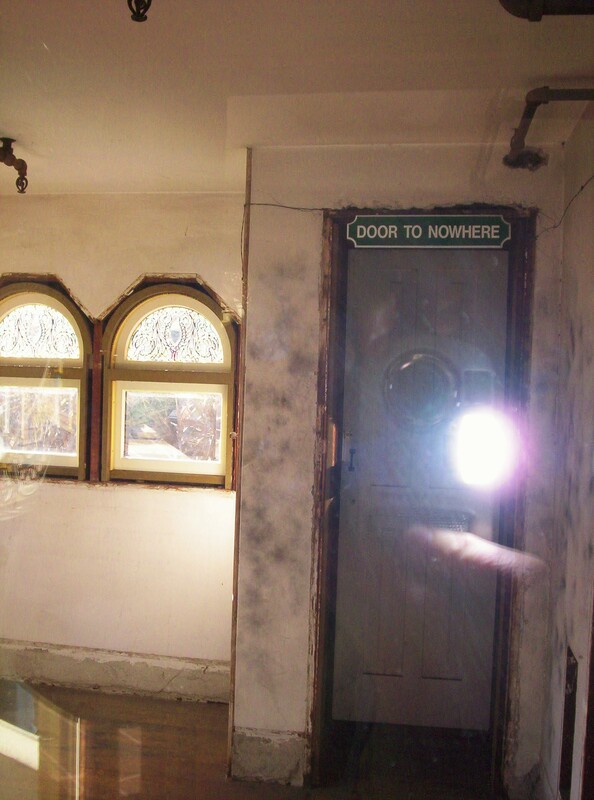 No door, no nothing – I don’t know if I ever took a picture of that. Marquee Movies: Oh, absolutely! Excellent point! I don’t for a minute get the impression that Mrs. Winchester was one to cower, or that she was any less than brilliant and quite actively engaged in life. The stories I’ve told here just barely scratch the surface. . . .
One revealing story was that she had a position open for a gardener, and three men applied. In the interviews, she gave them each the same order: to plant a row of [some plant] upside-down. The first guy said, “Yes, Ma’am!” and did it. The second guy said, “That’s crazy!” and didn’t do it. The third guy said, “Yes, Ma’am. But if I may make a suggestion: they grow better with the roots in the ground.” She hired the third guy — he clearly acknowledged that she was in charge, but he wasn’t afraid to speak his mind and put his expertise at her disposal. The sinks she designed were revolutionary for their time: the counters beside them are slightly inclined to allow for easier cleanup — the water flows naturally toward the drains. She designed a car wash in an outbuilding in which the hoses could be swung around in a ceiling-mounted frame, and in which cars could drive right into the building — quite standard features of car washes now, but on the cutting edge in her day. Yes, with all her high-tech gadgets, her seances, etc., I think she was having a rip-roaring good time — though I’m not saying that fear wasn’t a part of that. Holy cow! If I ever knew about that staircase at Concordia, I’ve forgotten it! That’s fascinating! What building was it in?! I should also clarify a couple things: in aerial shots, the mansion is quite impressive. In old black-and-white photos from before the earthquake, the mansion is imposing and looks exactly like you’d expect it to, dominating the landscape. The pictures I took of the outside are from the gardens, which you get to after you’ve paid your admission and gotten into the grounds. From the street out in front, there’s nothing at all that looks like a mansion. It really surprised me how hidden it is! And I didn’t notice this until I posted the photos, but don’t you like how the shadows of the palm trees fall ominously across the exterior? That’s a nice effect! 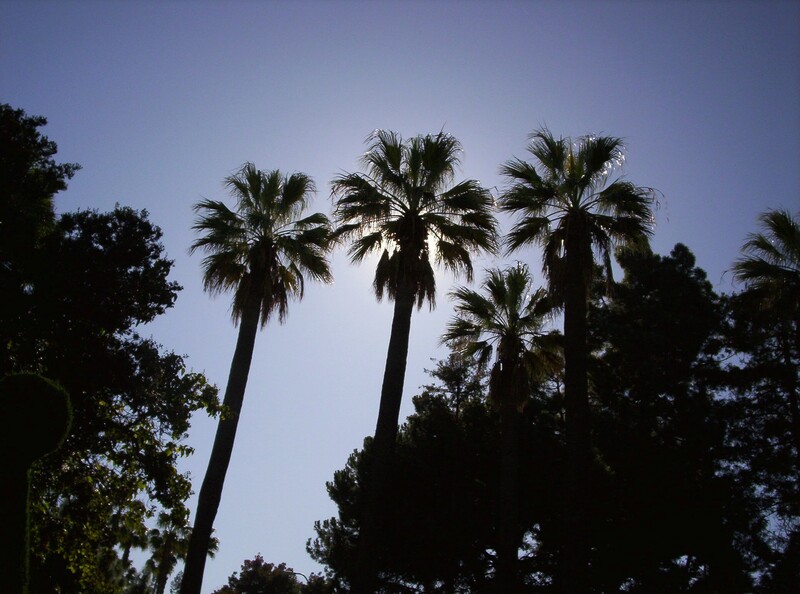 You can see by the shadows that they’re palm trees. Being a Midwesterner, I’m unused to the notion of mysterious mansions having palm trees outside. . . .
One more thing: although some higher parts of the house tumbled down during the great earthquake, the house didn’t sustain nearly the damage that such a quake normally would have caused. The reason is that the building rests on a series of separate foundations! Each section of the house can ride up and down independently of the others, which makes it highly resistant to earthquakes! Again, Mrs. Winchester’s innovation. . . . 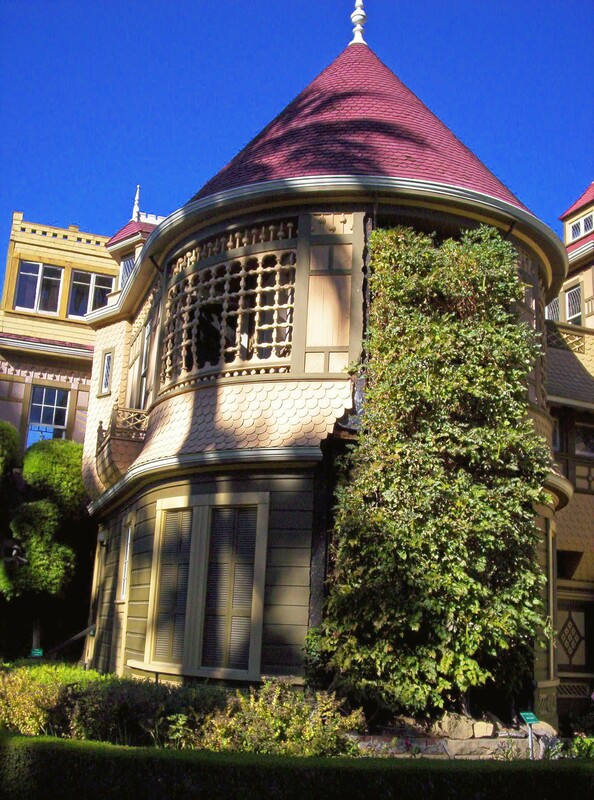 The Winchester House was used by Tim Powers’ in his book “Earthquake Weather”- to wonderful effect. I wonder if he visited it during the Convention. We used to live In CA, about 3 hours away from the Winchester maison! But then we moved to Texas in January so now we wish we could of gone to the winchest house!!! On a recent trip to San Francisco, I actually rented a car just to drive all the way to San Jose to the house…. It was very cool !! I think that if you look closely in the picture of her bed there is an orb above the back of the bed. Spooky. Well, now, that observation is perfectly timed for this Hallowe’en season! Thank you, Ms. “Hmmm”! Orbs are a controversial issue. Some people seem convinced they’re normally produced by light reflecting off dust inside the camera; some people believe they may be a form of spirit photography. I’m open-minded on the issue. Intrigued by your observation, I looked through this post again, and there are orbs all over the place! 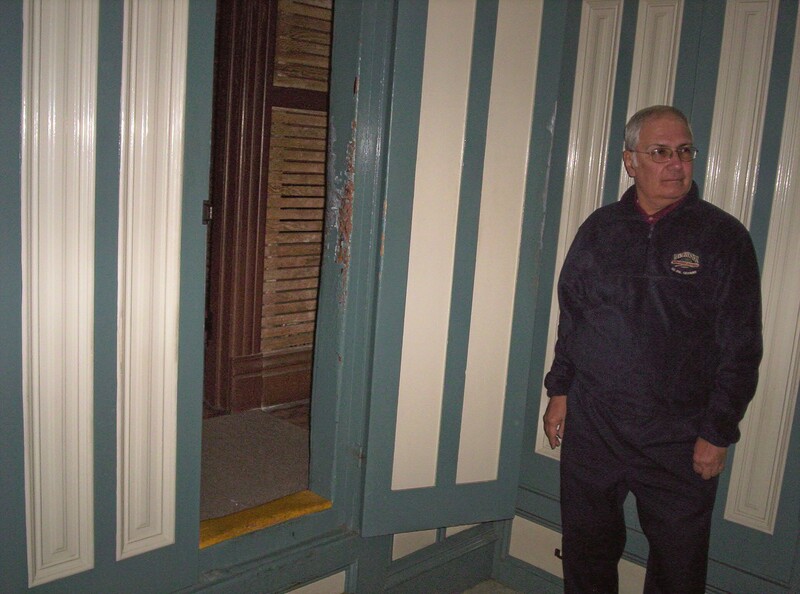 At just a quick run-through, I found some in the picture of our guide holding open the door to the really shallow closet and the photo right after that; the shot looking the other direction in Mrs. Winchester’s bedroom; the picture of the earthquake damage . . . and there may be others. They’re not always exactly in the same place, but they tend to be toward the right side of the photo and scattered along its top edge, which pushes me more toward the “dust in the camera” theory . . . but since they were all taken in the Winchester House, who knows? Yes, the one above the bed is the largest, and it is eerie! Wow! Thank you so much. When reading this I felt a very eerie feeling. I also kept going over the pictures for some reason. Maybe trying to catch a glimpse of her ghost. Thank you so sharing your experience.